← A real holiday timesaver! Saw this and thought the idea was great! The Newdog whelping system gives puppies a safe, clean and hygienic start in life. 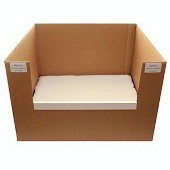 Made from strong, double walled, environmentally friendly cardboard, these whelping boxes are designed to be disposed of after use, avoiding any concerns with contamination from litter to litter. The naturally good insulating properties of the cardboard keep puppies safe and warm. The polished aluminum making them very durable and bacteria resistant. The Newdog “No Ruck” whelping mats eliminate the danger of puppies becoming trapped underneath the bedding. Made from thick, high quality fleece bedding stitched to a waterproof base material and a polypropylene inserted stiffener, these whelping mates have established an excellent reputation with dog breeders worldwide. They are machine washable and dryable. Available in 5 sizes to fit any breed. Available at Cherrybrook.